'Here if ever, a tribute of respect and admiration is due to departed worth.' These words appeared in Dale's obituary notice in The Glasgow Courier on 20th March, 1806. Robert Dale Owen, remembering the day of his grandfather's funeral, talks of the streets being lined with mourners. All the shops were shuut as a mark of respect and he notes Dale's death was seen in Glasgow as a 'public calamity'. Whoever and whatever this man was, the Glasgow public clearly knew of him and considered him worthy of recognition. In many ways, this new biography of Dale accords him similar 'respect and admiration', although it is far from an uncritical account. Struck by how little was actually known about the man who founded arguably the most famous cotton-spinning community in the world, the author had come to know about Dale only through an interest in Robert Owen's New Lanark and, in particular, Owen's visionary attempts to forge a 'new view' of society, based on his famous social and educational experiments in the village. There are numerous books, articals and journals about Robert Owen, but most of these include Dale as a rather minor figure in the history of New Lanark, even though the mills were internationally renowned during Dale's ownership before Owen had come to Scotland. This new book reflects 30 years of research by the author since the publication of his work on Dale in 1983. With foreword by Professor John R. Hume, Chairman, Royal Commission on the Ancient and Historical Monuments of Scotland. David McLaren's life of David Dale is an outstanding biography. 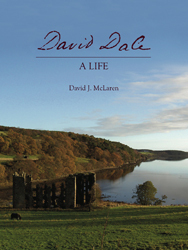 It is an intriguing story of a truly great man, and also a work of scholarship; everything McLaren writes is meticulously researched and supported with multiple references and all manner of documentation, as he skilfully builds an entirely cohesive and detailed picture of Dale's life and work. Dale's unique combination of entrepreneurial business talent as manifest to this day in the World Heritage Site of New Lanark � representing but part of his enormous achievement � with his commitment to the education and welfare of the poor, all underpinned by hard work, resolve and Christian principle adds up to something truly admirable, and a picture of a man conveyed with skill by an author with peerless knowledge of his subject. Dale was focused on the needs of people for, above all, employment, and he used his considerable success in business and commerce to provide work and institutions to better the lives of many hundreds of Scots in his own employment and many thousands in the employment of others through his agency of the Royal Bank, at the same time as he was inter alia a significant leader in the campaign to bring an end to the outrage of the slave trade. Dale's son-in-law Robert Owen � clearly a man of some talent if less straightforward � had a hard act to follow, and posterity has, we infer, been generous in assigning credit to the younger man for much that Dale initiated and implemented. This book does not have the purpose of redressing the balance in their respective legacies, but the author's view � and his evidence � is clear. Today Dale's considerable achievements speak for themselves, and this book articulates Dale's story with skill and scholarship and, we sense, not a little affection. Beautifully crafted, elegantly written, entertaining, inspiring; and warmly recommended. Dale was �a bright luminary to Scotland�, and Scotland and Scotland's friends owe a considerable debt of gratitude to David McLaren for his painstaking work on building a compelling picture of this unique and memorable life. Schools, public libraries, visitors to New Lanark, students of Scottish history and readers of great biographies should all acquire a copy, and read this magnificent and important book.